High-bandwidth PXI Express/CompactPCI Express-compatible system controller. 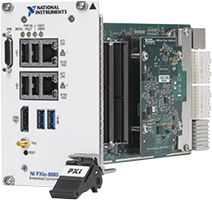 The PXIe-8880 is a high-performance embedded controller for use in PXI Express systems. With the 2.3 GHz base frequency (3.4 GHz single-core, Turbo Boost mode) eight-core processor with up to 16 hyperthreaded virtual cores and the triple-channel 1866 MHz DDR4 memory, this controller is ideal for processor-intensive RF, modular instrumentation, and DAQ applications.